Pests of Pome Fruit, Stone Fruit and Vines have long been the focus of study in pheromone use. Pests such as Codling moth, Laspeyresia (Cydia) pomonella, have been investigated over the years and effective models produced to effectively manage this pest using pheromones not only to monitor but also to control the population growth through mating disruption. Spotted Wing Drosophila (SWD) or Drosophila suzukii is already causing damage across Europe on cherries, peach, raspberries, blackberries, blueberries, grapes and strawberries. It has spread across Italy since 2009. No pheromone exists but the insect responds to odour attractants. Sentomol is testing, products in a variety of EU markets and are ready to work with UK growers who have genuine concern about the impact this insect may bring to the UK fruit crop. Other Fruit Flies such as the Mediterranean Fruit Fly (Ceratitius capita) and Olive Fruit Fly (Bactrocera oleae) have been successfully monitored and even controlled in their respective crops through the correct use of traps and attractants and it is hoped D suzukii can be equally well managed. As a non-native, suspected outbreaks of D suzukii should be reported to your local Fera Plant Health and Seeds Inspector. 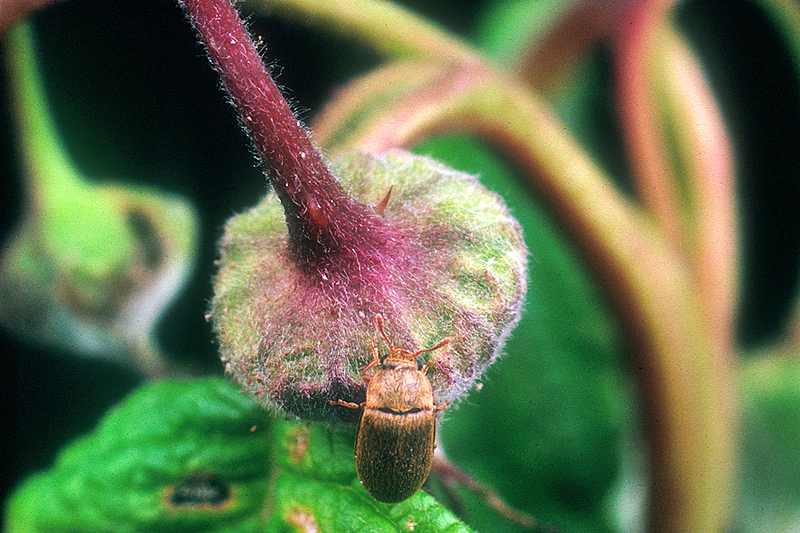 The Raspberry Beetle, Byturus tomentosus is a serious pest of Raspberries (field and tunnel grown) and other similar fruits such as Loganberry and Blackberry. The adult females are attracted by the colour and smell of the host plant’s flowers. The larvae feed on ripening fruits but can also damage buds and shoot tips. They burrow into the fruit berries to feed on the plug and often go undetected until the fruit is harvested. Sometimes localised areas of attacked berries become shrivelled, hard or distorted as a result of the larval feeding and pathogens can enter the developing fruit at beetle feeding sites. Previous work by SCRI (now part of The James Hutton Institute) on commercial farms, together with collaborative on-farm trials in Norway, Switzerland and France, indicates that traps based on the key visual and olfactory characteristics of the raspberry flower, are effective in trapping and controlling damage caused by raspberry beetle in protected raspberry plantations, particularly with low-moderate populations of raspberry beetles. The traps mimic the white colour of raspberry flowers, while the chemical attractant is based on floral extracts. Existing products consists of converted moth traps; green funnel traps adapted with white cross vane attachments into which an attractant is inserted. The trap is designed so that insects are attracted by both the white colour of the cross vanes (simulating a giant raspberry flower), and the chemical parapheromone dispenser. Beetles fly into the cross vanes and fall into the funnel shaped catchment area down into the bucket below, from where they can be regularly collected, counted and disposed. Sentomol today offers traps and attractants for the raspberry beetle, to both researchers and growers and we are continuing to work with the James Hutton Institute, other European and Scandinavian partners, to generate more data to have a full understanding of this and other soft fruit insect pests. Catch thresholds are still in the development stage for raspberry crops and as a consequence accurate recommendations are not yet available to growers. As a guideline, a trap catch of 5 to 10 beetles per trap per week in the period from beetle emergence until onset of first flowering should be used as a threshold until further data is available. If more than 5-10 beetles are found in the sampling period, then application of an appropriate control measure should be made. Development work is continuing to take this trapping technology further not just for monitoring but also potentially for control as well. The results it is hoped will be suitable not only for organic producers but conventional raspberry growers who are keen to meet fruit buyers demands for high quality fruit with low or no pesticide residue.